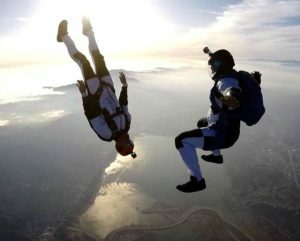 Too Wrapped Up is a Skydiving Canopy Formation team based out of Lake Elsinore California. 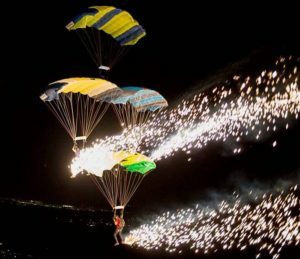 With a 5th place at the World Parachuting Championships Mondial 2016 Chicago, 4th place at the World Parachuting Championships Mondial 2012 Dubai, and a GOLD medals in the 2012, 2013, 2014, 2015, and 2016 US Parachuting Championships, Too Wrapped Up is the USA’s best Canopy Relative Work Rotations Team. We are currently the US Record holders for 4 Way Rotations. 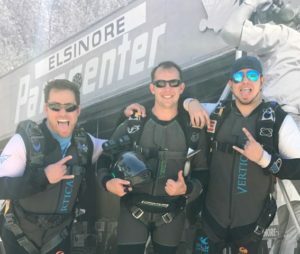 The Elsinore Hawks are a Mixed Formation skydiving team with Chris Dare, Ruben Granados, and Kevin Haugh. 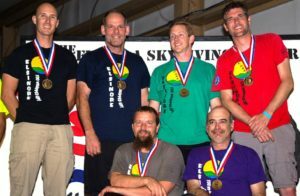 The team started competing together in 2014, with Chris and Kevin flying for the Belly RW team Horizontal Ignition with Ruben flying camera. 2015 with Chris Dare, Ruben Granados, and Nadav Shwartz. started free flying and became the Elsinore Hawks. They went from 400 jumps each to over 1000 jumps each in that year and brought home the Bronze to Elsinore in MFS Advance.